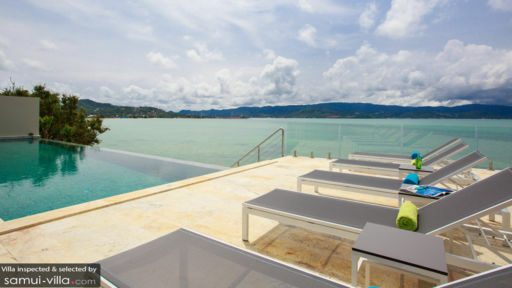 Villa Manta on the coast of Samui, close to Bang Rak beach and is a beachfront property with splendid views of the sparkling ocean. Overlooking the horizon, the villa has two levels with four bedrooms – two on each floor – an infinity private swimming pool, and lush, verdant gardens to enhance the natural beauty of the entire property. For your recreation, the villa offers amenities including and outdoor billiards table, in-house massages upon request, and other fun activities! 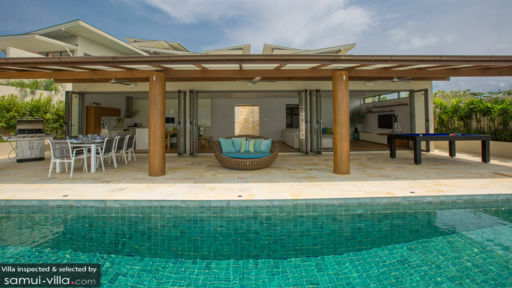 With four bedrooms spread two on each floors of the villa, it is aptly spacious for enough guests, be it friends and family. The bedrooms are bright and cheerful with light wood furniture, flooring, and large glass windows with gorgeous ocean views. Three bedrooms are furnished with king-sized beds and one is furnished with twin-beds, since the bedrooms are air-conditioned they are kept comfortably cool for everyone. Each of the four bedrooms features its own lavish en-suite bathroom that has been designed in a contemporary fashion with black walls and granite stone counters for a sleek look. There are freestanding bathtubs for tranquil baths complete with bath salts! As far as the eyes can see, you have the mesmerizing panorama of the ocean, skies, and tropical vegetation in front of you. Relax in the 17-metre swimming pool, which sports an infinity edge so you can relax as if part of the ocean, enjoying the little things in life on a grand scale. There is a rattan, circular daybed in the centre of the porch where guests can snuggle up with a good book, and relish the soothing sounds of nature. Sunbathe on the deck chairs or take a nap in the afternoon. There are deck chairs placed on the clifftop facing the ocean and other places which serve as excellent vantage points! The serene living area at Villa Manta is done in colours of the sea with aquamarine, sea green, and white or grey being the main tones. The lightly-coloured wooden flooring automatically enhances the cosy ambiance of the room, and the glass doors that open out to the veranda and then the pool, offer enviable views of the ocean in the distance. The room is furnished with comfortable sofas in light greys and a massive, flat-screen TV along with a couple of bookshelves. Some indoor plants freshen up the room even further, including the open-plan structure. The other side of the living area is occupied by the dining area and kitchen including a corner dining area with half a sofa and a bench around a rustic, wooden table. An alfresco dining area is also accessible out on the veranda for a memorable experience amidst the open-skies. The minimal living area is then complete with an open-plan kitchen with a lot of woodwork and white finishes. There are modern appliances and equipment like microwave/oven, coffee machine, refrigerator, and others for the use of guests. Besides the gorgeous pool and view, the villa offers many other fun things for you to engage in including a BBQ, billiards, boat rentals upon request, and others. Housekeeping and management is looked after by the staff at the villa so you can spend enjoying yourself without a worry. To request for meal preparation, the staff is ready to help without hesitation. The villa is a beachfront property putting you close to the ocean and the sandy shores. Other beaches nearby include Thong Son Bay beach and Samrong Bay which are laidback beaches with little to no crowds! I can't say enough wonderful things about this villa, the staff and the owner. We were a party of 5 adults and 1 infant and booked over New Years. Regina, the villa owner, couldn't do enough to make sure all our needs were met prior to arriving. The villa itself is well appointed and the views from the main house and bedroom balconies were magnificent. We especially loved that each bedroom was like separate, mini-hotel room. It meant we could enjoy privacy as well as time with the group. And we adored the food that Khun Moi cooked for us. We even spent New Years eve at the house and organised for her to cook our NYE dinner because we loved her food so much. Highly recommend this villa! Christmas lunch is shaping up to be a combination of seafood and BBQ here at the Villa, there is really no need to go anywhere else as there is everything that we need right here, great location, excellent facilities and wonderful cooks so we couldn't ask for a more perfect Christmas Day. A very cleverly designed villa. All 4 bedrooms have wonderful sea views and their own individual patios with seating and loungers. The live-in staff were very attentive without being imposing and provided excellent service, food - and cocktails!!. A large infinity pool with amazing views across the bay. There is plenty to see and explore on the island and the local people are warm and friendly. A visit to the Friday Night Market is a must!! I had an absolutely fabulous time during my stay at Villa Manta. The villa is located on an expansive section with a gorgeous view of the ocean which can be enjoyed during the day while swimming in the pool or in the evening as the sun sets over the mountains on the other side of the bay. While staying at Villa Manta we ate out at the local restaurants which were very good, however without out a doubt the best food I had in Thailand was made by Mai, the very talented in house chef. We had delicious spring rolls, freshly caught whitebait, and a lovely creamy thai curry. I also enjoyed Villa Manta's unique and spacious design. As you enter the villa past the goldfish pond and onto the main stairway you really feel like you're in your own paradise. Every room in the villa has a view of the ocean but has also been positioned to offer privacy from neighbouring properties. This gives the feeling of peace and seclusion which was a welcome relief after spending time in the fast paced world of Bangkok. I had a wonderful time staying at Villa Manta Samui and 100% recommend to anyone looking to travel to Koh Samui. We stayed as a family of 7 last year and decided that we wanted to stay at the gorgeous Villa Manta again this Easter. We had an amazing 6 nights and thoroughly enjoyed all the amenities and activities offered by Villa Manta. We were lucky to enjoy a fantastic massage on the new massage tables that are now at the villa. There is construction going on next door but it wasn't an issue at all, only a small amount of noise and the workers were very good at ensuring our privacy. Unfortunately it rained 5 out of the 6 days we were there, however with the endless Movies/TV shows/pool table/pool all of the kids were kept entertained. Muey and Nu were absolutely fantastic and we utilised eating in quite often and the meals were always delicious. Waking up to a breakfast so beautifully laid out every morning was such a luxury. The fruit was super delicious! Lunch and dinner were always so tasty and they accommodated any wish we had for meals. Peter the Villa Manager dropped around to check that everything was as it should be and he was super helpful again in organising special balloons and cake for Mimi's birthday while we were there. 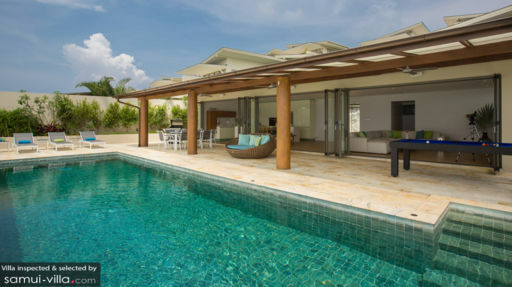 We don't even bother looking around at other villa options In Koh Samui as Villa Manta fulfils all our requirements for a relaxing holiday, and close to Chaweng if you wish to venture out for the day.